Tattumi provide high quality personalised and custom temporary tattoos for almost any occasion. You can design, customise and order online in minutes. We offer fast, free UK delivery and our custom temporary tattoos are easy to apply. Tattumi was born in the late summer of 2015. Our high quality temporary tattoos look the part, but you can part ways with them after 3-7 days. You can test the water with designs that you’re thinking about having inked permanently, have a tattoo for a specific occasion, event or cause. Or you can push the boat out and have fun sporting something that no right-minded individual would otherwise have on a permanent basis. You can use our website to create a custom design from scratch, by importing any design of your choosing, pictures from Facebook and Instagram, or by importing any of the designs from our shop into our customisation tool. Simply choose a size and click to buy! 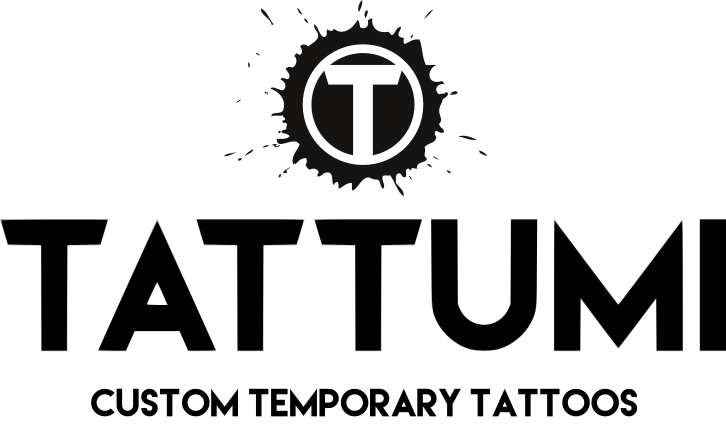 Tattumi also specialises in producing tattoos for events, sports competitions, social causes and promotions for companies. A fun, eye-catching and highly enagagement way of getting your brand seen. The temporary tattoos (or fake tattoos) that we create and sell come in the form of transfers that you apply to your skin. Simply remove the transparent film, apply the tattoo face down to the skin, and wet the reverse until it readily slides off. The transfers we create are specifically designed high quality and non-toxic transfer paper. How do I apply my fabulous new custom temporary tattoo from Tattumi? Pick a smooth, dry and clean area of skin. Remove the transparent film over the logo gently and apply the tattoo paper face down onto skin, pressing down gently and holding for 20 seconds. Wet the whole of the backing paper through using a cloth and wait 20 seconds. Carefully slide the backing paper away to reveal your temporary tattoo. (If it is not sliding away, or sticking slightly, simply add a bit more water). How long do Tattumi tattoos stay on for? Your tattoo should last between 3-7 days in good condition. This is dependent on skin type (hairy areas and oily skin reduces wear time), and where you put your tattoos. Areas prone to rubbing and where the skin is stretched considerably by movement shorten life span. What if I want to remove my tattoo sooner? If you wish to remove your tattoo sooner, they can be quite easily removed with oil based products. Yes. The tattoo transfer paper is safe and non-toxic, and hypo-allergically tested. In the unlikely event that f any reaction occurs simply remove with oil based products. Any queries, please email us at info@tattumi.co.uk . I’ve just ordered. How quickly will my order arrive? We make all our custom temporary tattoos to order. We aim to produce you order as fast as possible and most orders are processed and dispatched within 48hrs, but please allow up to a week from order to dispatch. Our orders are dispatched by royal mail standard 1st class and you will receive an order complete email once this has taken place Although this is not a guaranteed service most orders are delivered within 24hrs. If you need advice or have an urgent requirement, you can email us at info@tattumi.co.uk. Please also see our Terms of Service and Privacy & Cookies Policy.